Account of our presence in the area. 2007 : First steps in Egypt. 2008 : First attendance to the trade fair Agrena* in Egypt. First purchase of seeds in Egypt. 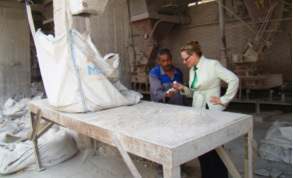 2009 : First sales of minerals in Egypt. Trade fair Agrena. 2010 : First sales of minerals in Saudi Arabia. Trade fair Agrena. Trade fair Arab Fertilisers Association in Tunisia. 2011 : Trade fair Agrena. Trade fair Gulf Food* in Dubai. 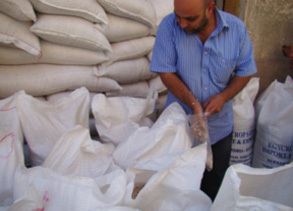 First sales of minerals in Jordan. 2012 : First sales of dairy products in Egypt. Trade fair Agrena. Trade fair AgraME* in Dubai. Trade fair SIPSA* in Algeria. 2013 : First sales of dairy products in Algeria and Saudi Arabia. Trade fair Agrena in Egypt and trade fair Dawajine* in Morocco. 2014 : Sales in Morocco, Tunisia and Libya. Trade fair Agrena in Egypt and trade fair Pamed* in Tunisia. 2015 - 2016 : Sales in Morocco, Tunisia and Egypt. *Trade fair Agrena : Poultry, cattle and fish fair from in Middle East. Trade fair Gulf Food : Professional food-processing fair in Dubai. Trade fair AgraME : Fair of farming, irrigation, breeding, poultry, flower industry/tree cultivation, fishing and aquaculture. Trade fair SIPSA : International fair of breeding, food-processing and farming equipment. Trade fair Dawajine : Poultry fair in Casablanca. Trade fair Pamed : Mediterranean fair of animal production and export crops. Magnesium oxide in powder, fine granules or balls (2-4 mm) form. Vegetable proteins as soya meal, wheat bran or condensed molasses-solubles in different forms. Skimmed, whole or fat filled milk powders. Rennet and acid casein and caseinates. Protein concentrates and sweet, sour, de-mineralised of fat filled powder whey. Lactose, milk, butter and buttermilk, and cheeses.